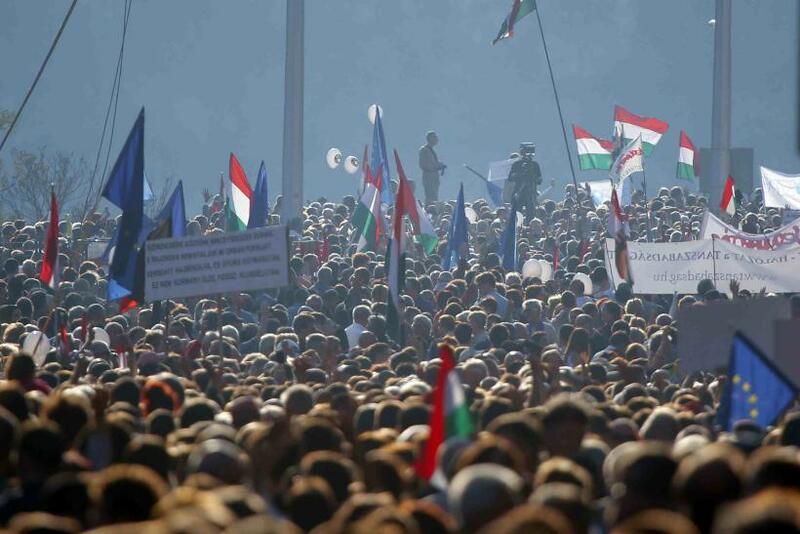 Protests in Budapest against the Hungarian government marked the 56th anniversary of the failed 1956 revolution against the Soviet Union Tuesday. While the anniversary served as a political backdrop for current grievances, the peaceful protests served as a testament to the value of free democratic expression in stark contrast to the brutal suppression witnessed more than half a century ago. By 1956, Hungary’s Communist government was firmly under the influence of the Soviet Union. The political opposition was mostly in jail or in labor camps, the economy was under state control and insulated within the Eastern Bloc, and Soviet forces were at hand to intervene if anything threatened to change. Public protests had been building up over the stagnating economy and suppression of democratic freedoms, particularly among student organizations. The situation came to a head on Oct. 23, when state police opened fire on thousands of protesters in Budapest outside a radio station where a group of students had been detained after attempting to broadcast an anti-Soviet message. The violence sparked retaliation among the protestors, who began to overwhelm the state police. When soldiers from the regular Hungarian army arrived to reinforce the state police, they instead sided with the protesters, though it would not be long before the Red Army would arrive to suppress them. The next day, Soviet tanks entered Budapest, and over the next few days an armed resistance fought skirmishes in the streets. As the fighting intensified, party leaders fled the country and the government effectively collapsed. By Oct. 30, the Soviets were fought to a standstill and most had withdrawn to the countryside. (They were later reinforced and returned to Budapest). A new government was quickly established, and on Nov. 1, it declared neutrality and Hungary’s withdrawal from the Warsaw Pact, the mutual defense treaty among the Soviet bloc countries. But the Soviet Union was not willing to let Hungary go without a fight and Soviet forces were increased and dispatched again to take Budapest. On Nov. 4, Soviet troops overwhelmed the Hungarian army and other resistance fighters, and a new pro-Soviet government under the Hungarian Socialist Workers’ Party (MSZMP) (Communist) was installed. Hungary would remain under Soviet influence until 1989, when it crucially aided the collapse of communism in Eastern Europe by letting East Germans flee to the West through its territory. From the remnants of the MSZMP, the Hungarian Socialist Party formed. The reformed Socialists have taken a more liberal approach to the economy, supporting free enterprise and less government intervention. These policies, however, caused a rift with Socialist hardliners in the party, who split off to form the Hungarian Communist Workers’ Party. The Socialists became the dominant center-left party, while the Workers’ Party remains marginal. But in the 2010 election the conservative Fidesz Party led by Viktor Orban swept to power with a two-thirds majority in Parliament, which let it adopt a new constitution. Now Fidesz is accused by the Socialists and other members of the opposition of centralizing too much power and eroding democratic freedoms. “This government has broken, systematically, vertebra by vertebra, the backbone of Hungarian democracy,” said Gordon Bajnai, who served as prime minister from 2009 to 2010 during the last Socialist-run government. “The state has become a tool for corruption." Prime Minister Orban’s government rewrote the constitution upon taking power, restricting judicial powers and has since passed legislation restricting the media. It is also seeking to rebalance the electoral system in its favor before the 2014 elections. Orban, meanwhile, has tried to deflect criticism toward the E.U., which he has likened to “Soviet overlords,” following its criticism of his economic policies amid the deepening European debt crisis. The Soviet Union may have collapsed over two decades ago, but in Hungary it still has symbolic value as a representation of an overreach of power.